Added on April 15, 2019 by Tendayi Viki. Uncertainty is the central characteristic of innovation. While generating new ideas and inventing new technologies is important, it is even more important for innovators to identify the unknowns that have to be true for their ideas and technologies to succeed in the market. We can only claim to have succeeded at innovation when we find the right business model to profitably take our idea or technology to market. At the strategy level, there are several frameworks that have been developed to help leaders understand their product and service portfolios and make decisions. These frameworks use different dimensions that hide in plain sight, the real challenge that leaders are facing - i.e. managing uncertainty. We all love a good 2X2 matrix and the Ansoff Matrix is a powerful one. Published in 1957, this framework uses the two dimensions of product versus market to identify four key strategic decisions that leaders have to make: improving existing products for existing markets (e.g. Google constantly improving their search engine), taking existing products to new markets (e.g. Google’s foray into China), developing new products for existing markets (e.g. Google launching GMail) or developing new products for new markets (e.g. Google’s investments in driverless cars). A recent improvement of this framework is the Innovation Ambition Matrix by Nagji and Tuff. This places the 2X2 matrix along a two dimensional continuum that identifies three types of innovation: core innovation which is about improving existing products for existing markets (e.g. Amazon investing in drones to improve delivery times), adjacent innovation which covers taking existing products into new markets and developing new products for existing markets (e.g. Amazon developing the Kindle), and transformational innovation which is mainly about developing new products for new markets (e.g. Amazon launching AWS). Nagji, B., & Tuff, G. (2012). Managing your innovation portfolio. Harvard Business Review, 90(5), 66-74. The McKinsey framework is perhaps the most popular of them all. This framework maps two dimensions of value and time to create three horizons. The nearest horizon is Horizon 1 where we extend the core and generate value for the company straight away. In Horizon 2, we build businesses around new opportunities with potential to impact revenues in the near term. The farthest horizon is Horizon 3 where visionaries work on viable options that will only deliver value to the company after several years. A great example of the Three Horizons approach was when Facebook’s CEO Mark Zuckerberg announced the company’s ten year roadmap at the F8 conference in April 2016. The roadmap was divided into three sections: the first three years were focused on improving Facebook as an ecosystem; the five year horizon was focused on strengthening products such as WhatsApp and Instagram; and the ten year horizon included technologies such as artificial intelligence and virtual reality. There are other frameworks of a similar mold including Geofrey Moore’s Zone to Win, but we won’t get into all of those here. For us at Strategyzer, what we have found most striking about these frameworks is that they are all describing uncertainty without saying so explicitly. Within the Ansoff Matrix or the Innovation Ambition Matrix optimizing existing products for existing markets represents the lowest levels of risk. We can be relatively certain of success because we are working on known products for known customers using our current business model. The moment we step out of this comfort zone, we start introducing uncertainty. If we take our existing product to new markets, we may know the product but we now have to manage market risk (i.e. desirability). If we start creating a new product for current markets, we may know the market, but we now have to manage technical risk (i.e. feasibility). The ultimate level of uncertainty is when we create new products for new markets. This is because everything in our business model changes; from customer segments, key activities, key resources, channels, pricing and many other things. Within McKinsey’s Three Horizons framework, the element of uncertainty is represented by time. The lowest level of risk is when we know that we will get value into the organization within this financial year. As we increase the time to over 5-10 years, we also increase the uncertainty of getting that value back into the organization. As such, the most critical feature of Horizon 3 is uncertainty, not time. In developing the Business Portfolio Map, Alex Osterwalder and Yves Pigneur make explicit the core dimensions of managing innovation. They distinguish between the exploration of new business models with high levels of uncertainty and the exploitation of current business models with lower levels of uncertainty. The Portfolio Map takes a bottom line approach by focusing on what business leaders really care about: the potential size of returns from their investments and the level of uncertainty related to getting those returns (i.e. innovation risk and disruption risk). This approach makes explicit that the job of innovators is to work everyday to reduce uncertainty by increasing the likelihood and magnitude of success (i.e. viability). 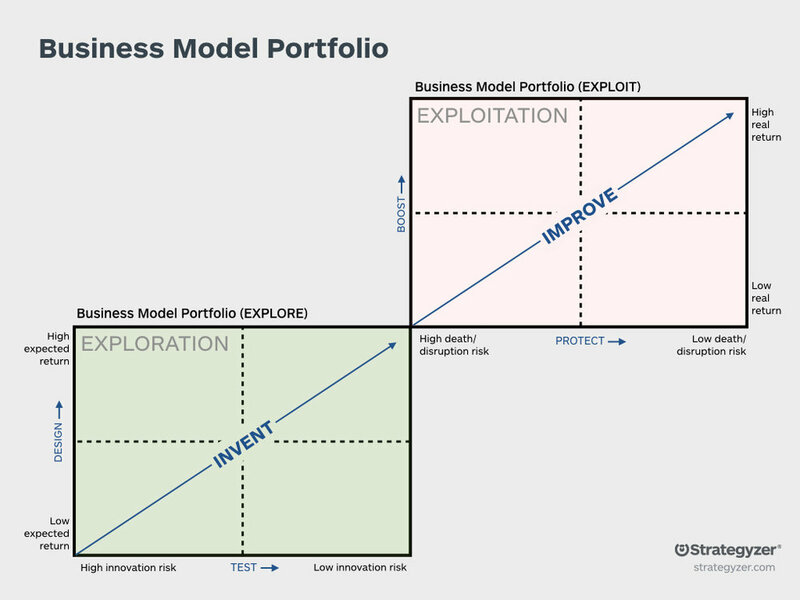 Using the Portfolio Map, leaders can keep an eye on their portfolio of business models and get a clear sense of where they are with regard to risks and returns. If we are working on a new value proposition, we have high levels of uncertainty and our task is to reduce risk. If we are managing a mature product or service, we have low levels of uncertainty until we face disruption. Disruption introduces new levels of uncertainty that then require us to reinvent our business model. The key takeaway for leaders and practitioners here is that leading innovation is ultimately about managing uncertainty. To learn more about using the Portfolio Map, sign up for updates on our upcoming book, The Invincible Company.